Last week I visited with two county managers—Steve Garrison in Rutherford County and Ashely Wooten in McDowell County. As with all of my manager visits, I thanked them for paying their membership dues and for their support. Both of the managers offered high praise for all of the services they get from the School—and as usual they highlighted the critical importance of our just-in-time advising. They emphasized how much their colleagues depend on us. 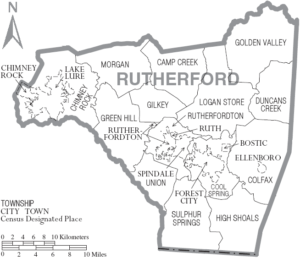 Rutherford and McDowell have been hit hard by the general economic dislocations that have affected many parts of North Carolina. The decline in textile and furniture manufacturing has caused the loss of many good jobs. 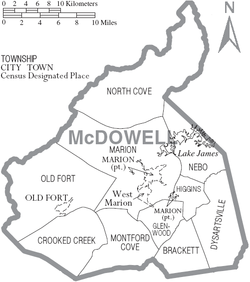 At one point a few years ago the unemployment rate in Rutherford County was a staggering 16%, and the poverty rate in McDowell County stands at 20%. Those stories unfortunately have been repeated in many other North Carolina counties. Here is the new wrinkle that surprised me. When I asked about the challenges facing their counties, both managers said exactly the same thing—employers are having trouble finding people who want to work. They were not saying that people wanted to work but just didn’t have the necessary skills, the so-called skills gap. No doubt that is a part of the challenge. Instead, companies are telling them that they cannot find enough people who are willing to work at available good-paying jobs. The timing was interesting because I had just finished reading a new book that may offer a partial explanation for the phenomenon described by the employers in Rutherford and McDowell counties—Hillbilly Elegy—A Memoir of a Family and Culture in Crisis by J.D. Vance. Vance is a self-described “Scots-Irish hillbilly” who comes from a long line of working-class people in Appalachian Kentucky. He argues that the loss of manufacturing jobs accounts for only part of the challenge facing many working-class whites—the focus of his book. 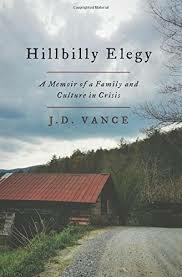 Vance describes a culture that reacts “to bad circumstances in the worst way possible. It’s about a culture that increasingly encourages social decay instead of counteracting it.” People feel that they have little control over their lives and so they blame everyone but themselves. Vance offers the following anecdote to illustrate his point. He worked in a medium-sized floor tile distribution business near his hometown the summer before attending Yale Law School. The job involved loading heavy boxes of tile onto shipping pallets. A 19-year-old guy started in the warehouse a few months before Vance. The guy’s girlfriend was pregnant and the manager offered her a clerical position answering phones. Both of them were terrible workers—they missed lots of work without notice, were chronically late, and had horrible work habits. When they were fired, the guy blamed the manager and lashed out at him. Vance saw at least two other people lose their jobs at the warehouse under similar circumstances during that same summer. I don’t know if there is a role for the School or the University in trying to figure out a way to contribute something in communities facing this serious challenge. It is a big so-called “wicked” problem, which often seems to be another way of saying there is nothing to be done. Vance is right that government can’t fix the problem. But there must be some role for government. This issue is plaguing many of our rural counties and I wanted to raise it because these two county managers mentioned it so prominently in my visits with them. Thanks for sharing your thoughts on this critical issue. I have been hearing these stories about people being unwilling to work and about self-destructive behaviors and cultures all my working life. They may be about people in rural areas, inner cities, desolate suburbs, or towns hit by economic hard times. We have all seen the evidence in the data and with our own eyes. We also know that things are not always what they seem or what is suggested by anecdotes. Drug and meth abuse, long-term ill-health and disability, and the long grind of poverty bring down even the strongest people and families – but that is not the whole story. Even in the poorest of counties, there are folks who are still getting up every day and trying to make a living for themselves and their families while still trying to help their communities. –	Encourage and support young people to become involved in their community and to imagine a future beyond anything their parents may have considered. Breaking inter-generational poverty and self-destruction has to be the priority. –	Find and support those in the community who do still have a spark – not just the usual suspects but also reaching out to women and immigrant families – building their leadership skills and encouraging their involvement in the life of the community through public service whether in elected office or in nonprofits. –	Focus on health and in particular on preventative care, drug rehabilitation, mental health services, neo-natal and infant care, to remove major barriers to active participation in the labor market and community life. Beyond that you move into well-trodden policy areas of K-12 education, workforce training, and economic development, which if working properly can have major impacts on these communities, but are more likely to be under-resourced and not up to the task…but that is another story. Thanks for this overview, Brian. It is not something I know much about, so it is nice to get your overview of possible strategies. I wonder if this might be an appropriate project for our Applied Public Policy Initiative once Anita gets on board. Thanks again for sharing this good information. Perhaps the role for government or the university is to convene conversations, to better understand what is truly going on and if communities see any role for government at any level in solutions. That might mean government taking direct action, doing nothing, or actively stepping out (reducing barriers) so others can step in. Thanks Mike. I’ve enjoyed my early conversations with Brian about his research interests and possible opportunities that APPI could support. This is also at least the third time in the past two weeks that someone has recommended “Hillbilly Elegy,” so it looks like I’m going to have to find a copy. Another set of things I’ve been reading in the last few years are books about Silicon Valley culture, such as Antonio Martinez’ recent one, Chaos Monkeys. The author of Hillbilly Elegy is now part of that culture. Much of that culture is consumed with the idea that government has little or no positive role in the world and should get out of the way–which is ironic for anyone who knows the history of Silicon Valley’s development. When I do read Hillbilly Elegy, I will try to keep in mind how hard, and usually dubious, it is for people in a privileged place to generalize about those who aren’t so fortunate. Thanks for sharing the contrary review, Richard. I think the blog author is setting up a bit of a straw man. Vance goes out of his way to say that he isn’t offering an academic analysis, and I don’t actually think he is making any kind of universal claim about the people of Appalachia. He describes his own experience, as well as that of his family and others from Kentucky, and focuses more on the personal toll. I think he raises some larger questions that are worth thinking about. One of the challenges today is to listen to people without automatically putting them in a particular ideological box, which is exactly what the blog author seems to do by making assumptions about Vance based on the people who endorsed the book. There is a certain amount of by-their-own-bootstraps feeling about it to be sure, and I’m generally skeptical about people making those claims. I’m interested in reading more about these issues. I have not had a chance to listen myself, but on the road driving back from Iowa recently heard that the author was interviewed just this past week by Terri Gross on Fresh Aire about the book. Here is the link (you may need to cut and paste into a web browser): http://www.npr.org/2016/08/17/490328484/hillbilly-elegy-recalls-a-childhood-where-poverty-was-the-family-tradition This might offer greater insight to the assumptions and his message. I avoided the interstates and kept to smaller roads and smaller towns in rural areas (Ohio, Michigan, Iowa, Kentucky). My overall impression: countless small, older empty homes for sale. At some point in the coming year or two or three, my elderly mother in law’s will join them. Perhaps telling symbol of change in demographics (age and mobility to cities), change in job and economic structures, and change in culture and sense of opportunity/future for the young.